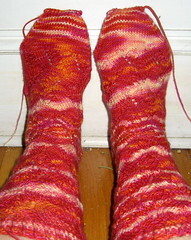 In a successful lsock completion exercise, I finished these fabulous objects with about eight inches to spare. Those dangling strings are all that was left... I broke it in the center and kitchenered the toes (with a certain amount of wailing and knashing of teeth) and now they are on, and quite, quite lovely. No one will inspect my toes. I figure if I keep throwing myself at the kitchenering, eventually I will attain proficiency. The second sock was better than the first, but I seem to forget how to do it with astonishing speed in between finished socks. Nice news is that my mother is house sitting the house next door, so she gets a small vacation and to visit us and sleep in a Real Bed (which she doesn't get to do at our house - we are very bad with guests) and come over for dinner and retreat to read in bed and brush her teeth in peace. Plus her dog gets to come too, to keep the neighbor dog company. It is win-win-win all around. I am looking forward to having her here for a couple days (Hi Mom! ).